We know you’re not dumb. You have savings but just have no time to put it to work. I understand. That’s why you need an investing for dummies; a set it and forget it strategy with no worries attached. These days just hearing the word “investment” is enough to send shivers down your spine. It’s been years since the American financial crisis and while we are definitely doing better, our wounds still ache. Everybody knows someone who lost a job or a huge chunk of their retirement savings. 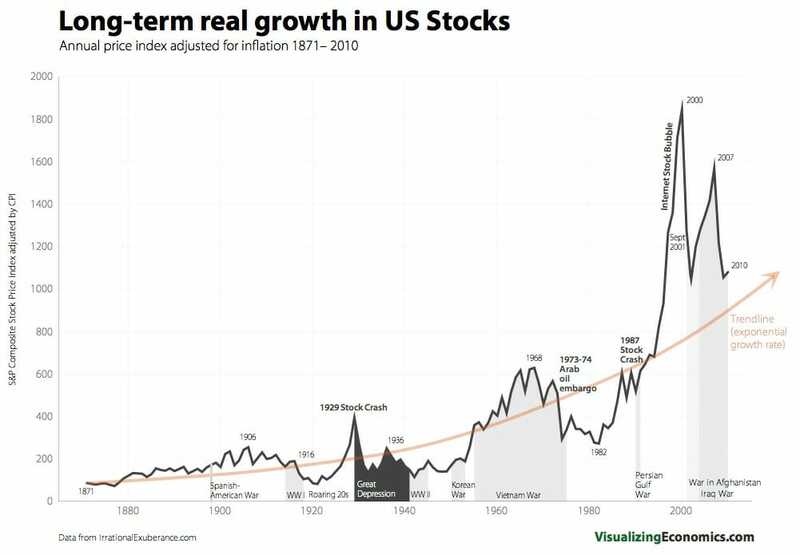 Depending on whom you ask you’ll hear a different reason for the crisis but the one take away from the whole thing is that now some people are afraid of the stock market. 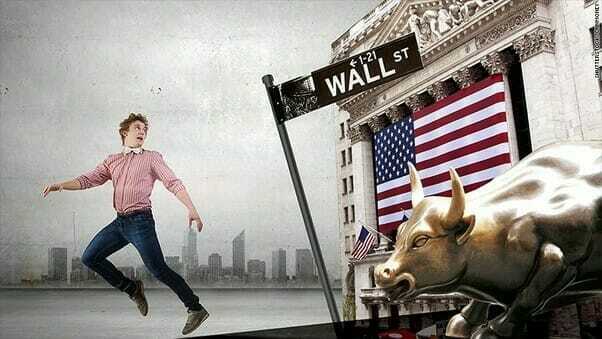 With those wild price fluctuations and monster crashes, why risk your money? Most people are just holding on to huge savings accounts that blow your mind at 1.0% interest. Now, while you have the lowest risks with your money in a savings account, you’re also making near zero investment gains. In fact, you’re losing money because inflation is about 2% a year. If you save $5,000 a year from the first year you start working until you retire, you’ll only have saved $246,190 at 1% interest. Probably not enough to retire. However, if you put it in at the yearly average market return of 10% over 40 years you will have $2,659,116 (yes, millions). Quite a difference, no? “But, it’s so risky and it’s too difficult, I don’t have the time to manage it.” Don’t worry my friend, it’s not nearly as difficult or risky as you think. An investing strategy is an important part of reaching your personal finance goals and a great way to start building wealth. If you are a new investor allow me to walk you through my patent pending Investing for Dummies No Effort Investment Strategy step by step. Think of it was your Investing 101 course. Every day you read in the news that Apple’s stock is up, Google’s is down, Coca Cola’s is sideways and McDonald’s workers are on strike; phew, it’s a confusing mess out there! Ignore it. Let the crazy people be crazy, let’s stay focused. There are two types of simple, set it and forget it investment options we will look at. 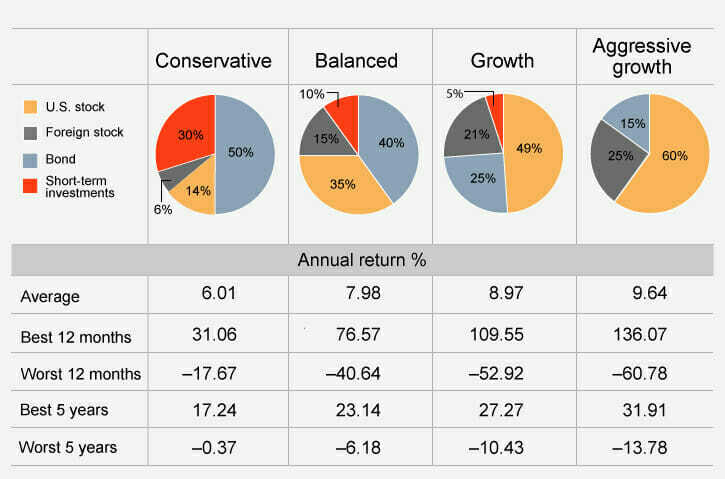 A market average and a managed fund. There are many market groupings already made for us, three of the most popular are the S&P 500, the NASDAQ and the Dow Jones Index. A market grouping is just a bunch of stocks that allow you to be diversified and reduce overall risk. All three Indices have solid, storied histories of constant returns and a clear method for how they choose what stocks are a part of their indexes. All of the indices span across a broad set of stocks (large blue chip, growth, staple goods, etc..). They may not give you the most aggressive returns the stock market has to offer but historically their return has been very solid and stable. The above indices are terrific, however, it is understandable that not all of us have an appetite for risk investments. Some people are very close to retirement and don’t want any risk at all. That’s completely understandable and until recently, being able to moderate your level of risk would involve quite a lot of active investing in a wide variety of investment products. Today there are a ton of roboadviors like Betterment, that can invest your money for you and getting better returns than financial advisors. 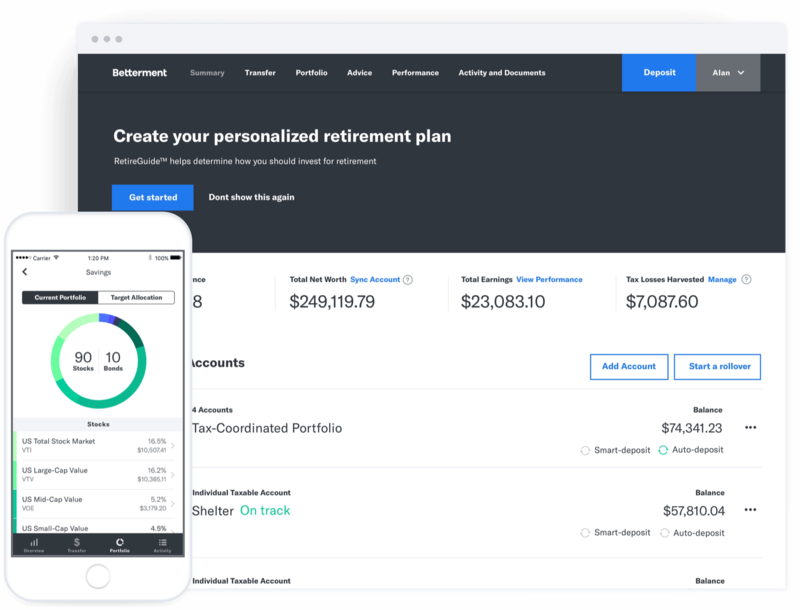 At its core, Betterment is a highly automated Robo-advisor that takes into account your age and risk tolerance to build you an optimal portfolio. Not only is your money liquid and available to be withdrawn at a moment’s notice but you also have a risk slider where you can tone down how aggressively your money is invested. Expertly diversified with the click of a mouse, it’s too easy! It also projects a best and worst case scenario for your money so you can count on your money being there when you need it. Probably the best part of Betterment is how it acts as a savings account. You easily transfer money in and out just like any savings account with no notion of trades. So to convert from your “savings account” way of life to your “Betterment account” way of life will be nearly seamless. The only difference is your money will actually work for you! Take a look at our Betterment Experiment where we put our own money on the line to give you an honest Betterment review. Regardless of the specific platform, you choose for your investments, or if you want to manage a portfolio on your own, you should consider the types of assets in which you’d like to invest. Two of the primary types of investment assets you can choose forms are stocks and bonds. When you invest in stocks you are purchasing equity or ownership in a business. Your level of equity depends on how much of the company’s individual stocks you own. If the business does well, your stocks become more valuable and you make money. If the business begins to become less profitable, your stocks lose value and you may lose money. Stocks are considered to be one of the most profitable investment assets, partially because they enable people to share in the profits of a business with a relatively small investment of capital. There are two kinds business equity investments: publicly traded and privately traded stocks. A publicly traded company is one that’s completely or partially owned by public investors. A company becomes publicly traded in an initial public offering (IPO), a process that makes business equity available to outside investors. When you invest in a publicly traded company, you are among thousands of other shareholders who have all invested in a given company. Because you may only hold a small fraction of the company, you won’t be able to influence major decisions for the business the way that a traditional private shareholder might. However, you are entitled to certain rights as a shareholder. Shareholders have a right to share in the profits of a business—and they also have the right to trade or sell their stocks as they see fit. A privately held company does not have stocks available on the public market. To invest in a privately held company, you will need to have a direct relationship with the founders of a business—or start the business yourself. This tends to be a far more direct investment that requires a significant amount of time and capital. In addition, you will have to assume considerable risk, as most business startups fail and do not become viable profitable in the long term. If you want to make an investment in business without spending hours a day agonizing over business decisions, you can invest in a company that is publicly traded on the market. This is a technique preferred by many of those looking for tips for investing for dummies. And, you can easily put this on auto-pilot. Sure, there was a huge spike in the market in 2000 and a giant dip in 2008 but look at the graph 3-4 years after any ridiculous stock event. The market trend gets back on track with you earning a serious return on your investment. It isn’t so much that you were a genius at picking individual stocks (because nobody really is), you just had the resolve to stay the course. You didn’t flip out and sell when things were bad, in fact, you don’t even plan on selling until you retire. Every year, you keep tacking that 10% gains onto the previous year’s balance + gains, leaving you with far from linear growth. The whole idea of investing in an Index, Betterment or other similar tools is long-term gains. Ideally, you’re going to just deposit money and ignore the account. Don’t get caught up in the latest news scare, and try to refrain from really looking at the numbers more frequently than once a month. You will not get rich overnight, almost no one has. But you can seriously start to build wealth. Ask Bill Gates how long it took for him to get as rich as he did and how much work is involved. The beauty of stock market investing is you invest in people like Bill Gates and let them do the work for you. Before you begin investing, it’s important that you take some time to evaluate your expectations. It is highly unlikely that one investment will make you millions overnight, so don’t expect to get rich quick by investing in stocks. Instead, understand the trend of the market and base your projections for growth on it. If your expectations are realistic from the start, you are much less likely to become discouraged by slow growth. If you are reliant on your portfolio of stocks to meet your basic needs, you are setting yourself up for stress and financial struggles. Think of your investments as a long-term savings account that will provide you with some extra capital in the next several decades. With a long-term mentality, you can make investments without feeling pressure to make money rapidly or pull your capital out of the market too quickly. 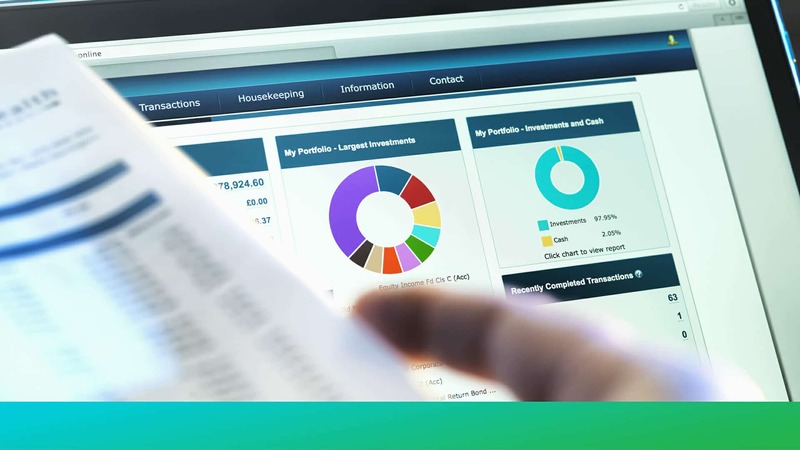 It’s easy to become so wrapped up in your portfolio that you constantly check the status of your investments. Although monitoring the status of your investments is important, it shouldn’t be done more than once a day. Checking your investments repeatedly can increase the anxiety you feel about your portfolio. Seeing every small fluctuation in the market is more likely to make you nervous than it is to help you make sound decisions about your portfolio. You can set up alerts that notify you when your stocks gain or lose a noteworthy amount of value. If you find yourself stressed about your investments or you are losing sleep over your portfolio, you should take some time to consider whether investing in the market is really the best choice for you. Or, you can consider handing off the management of your portfolio to a financial advisor. Don’t put all your eggs in one basket when it comes to stock investing. Counting on a single stock to carry your entire investment in the market leaves you vulnerable to losing the entire investment assets in one fell swoop if something goes awry in the company in which you invest. Try to spread out your investment over a dozen or more companies across different industries. Investing in mutual funds or ETF’s (exchange-traded fund) can give you multiple opportunities to profit. If you are looking to increase your principal investment as much as possible in a short period of time, you might be interested in curating an aggressive portfolio of stocks that have the greatest potential for a high return—but also come with more risks. However, if you are planning on maintaining a portfolio of investments over a longer period, you don’t have to make drastic investments to make money. 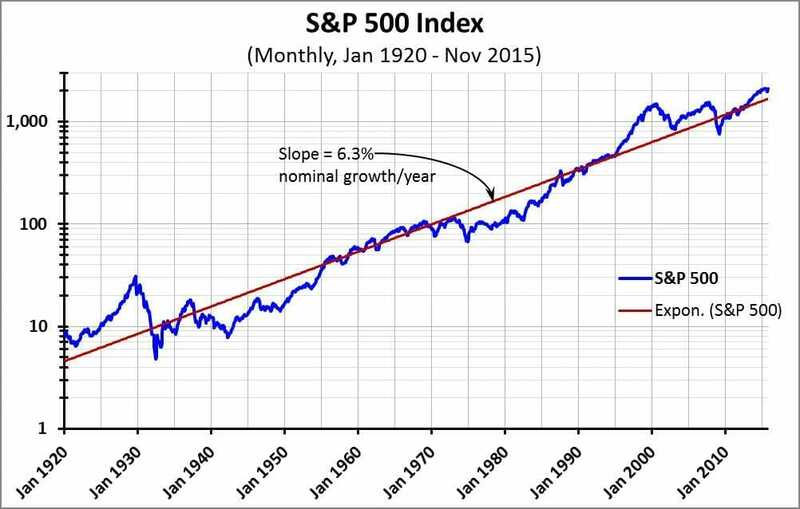 If you can simply keep pace with the market average of growth, you will be able to double your principal investment in just 10 years. You can also consider investing in bonds. This asset type is also known as fixed-income securities and is a debt instrument that investors purchase from a business. This debt provides a business with the capital it needs to grow and cover its costs. It gives investors the opportunity to make money back in interest. Although bonds are less volatile than stocks, stocks outperform bonds when it comes to long-term profitability. Normal people retire at 65 but that doesn’t mean that you should. I aspire to retire at least 20 years before then and you should too. It would be nice if I came up with a million dollar idea or won the lottery but I’m not going to count on it. Slow and steady wins the race. It takes a little investment planning. If you don’t know where to start Betterment has an awesome retirement calculator that will tell you how much you will need and help you with your investment strategy to get there. Ideally, the most work you should have to do is open your retirement account at a brokerage firm like Ameritrade, eTrade, Charles Schwab, etc… or Betterment and transfer your money slowly over time. The only difference between the brokerage firms is that you’ll actually have to place a trade into the S&P 500 (.INX), NASDAQ (.IXIC), or Dow Jones (.DJI). You can even dabble in some real estate investing to help reach your retirement goals faster. Not everyone is cut out to be a landlord but you don’t have to be to make money in real estate investing. With as little as $500 you can invest in a REIT with Fundrise. Not sure what a REIT is? Find out here. Fundrise is a crowdfunded platform that allows average investors access to real estate returns they could not access on their own or through a traditional REIT. If you are interested, check out our review here. 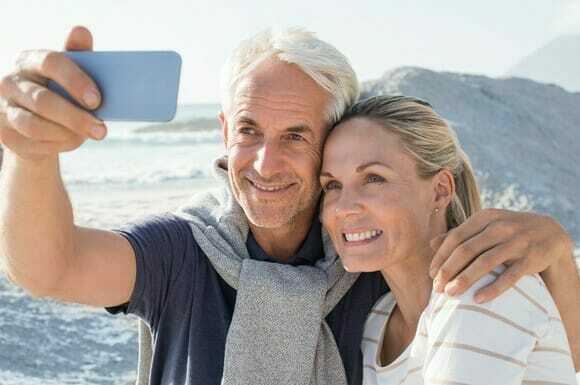 To give yourself the best chance at retiring early, it’s important that you take some additional steps to set yourself up for long-term financial success and a comfortable financial future. As you develop your assets, consider maintaining a relatively small budget in relation to your income. 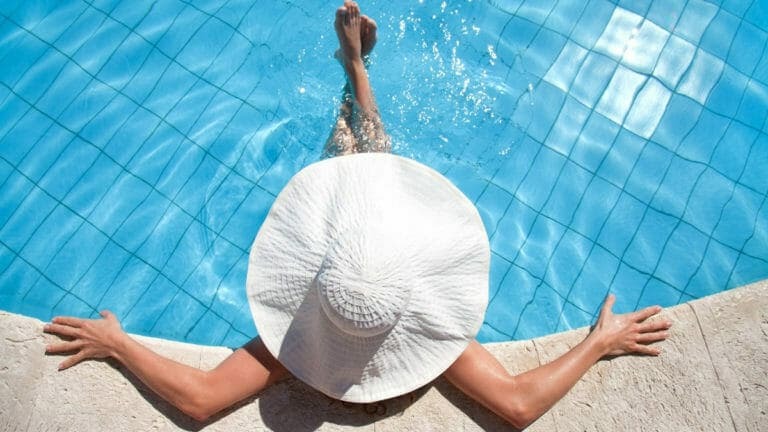 If your goal is truly to retire early, you should avoid spending a significant amount of your money on large purchases and focus on putting more of your money towards your savings. One of the best ways to do this is to stay in your starter home, rather than moving to a more expensive home before you retire. 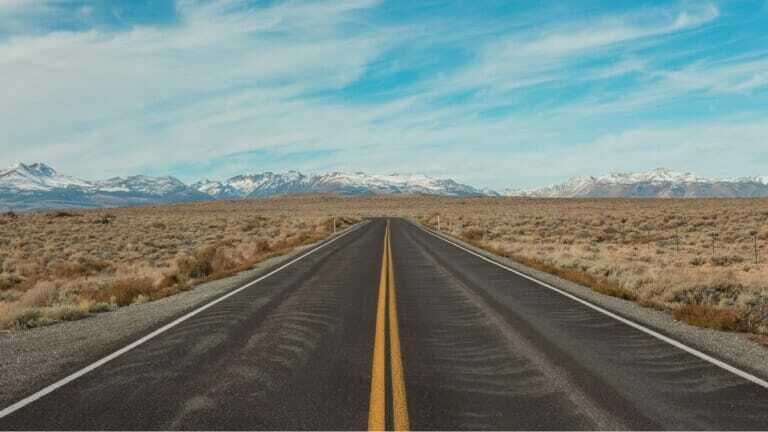 Good luck, and remember, every day you don’t put your money in the fast lane is an extra day you have to show up at the office. *Enjoyed this post, and ready for even more stellar investment advice? Yeah, you are. Visit LMM’s How to Invest Money page for articles, podcasts, and the actionable info you need to start investing now. P.S. If you are looking for the Investing for Dummies Book by Eric Tyson you can find it here.